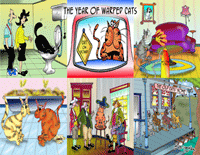 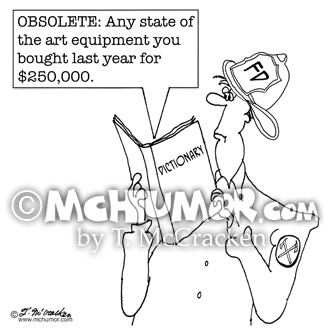 Fire Cartoon 6982: A fire fighter sees the definition of OBSOLETE in his dictionary as, "Any state of the art equipment you bought last year for $250,000." 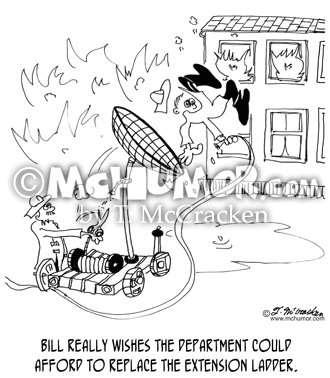 Fireman Cartoon 6255: "Bill really wishes the department could afford to replace the extension ladder." 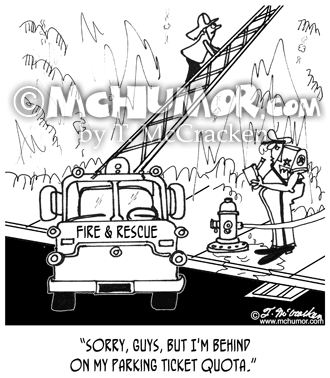 A fireman is catapulted up to the top of a building. 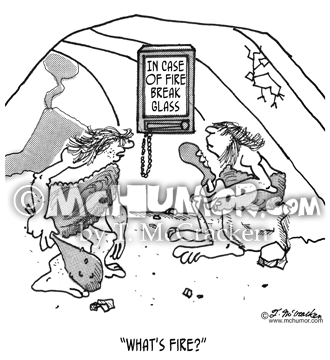 Fire Cartoon 1929: A caveman in front of a "In case of Fire, Break Glass" box asks, "What's fire?" 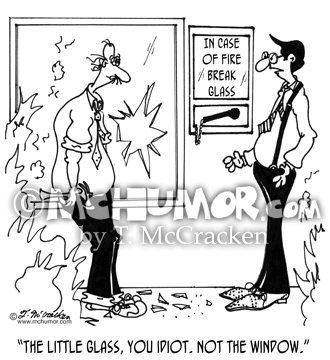 Fire Cartoon 5326: While a fire rages a man near an "In case of fire, break glass" breaks a window. 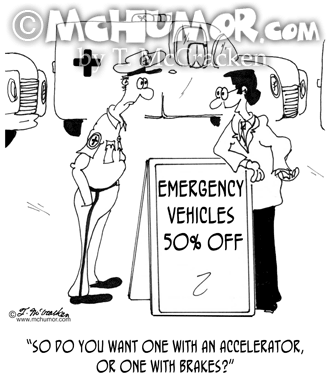 Another yells, "The little glass, you idiot. 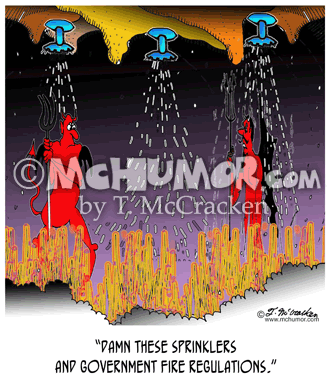 Not the window." 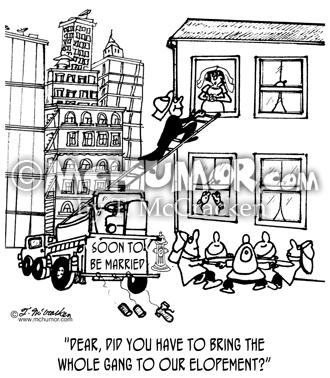 Fireman Cartoon 4065: A woman in a wedding gown asks a fireman in a Tux climbing a ladder from the fire truck, "Dear, did you have to bring the whole gang to our elopement?" 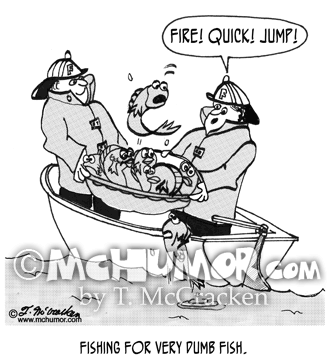 A group of fireman hold a net under her window. 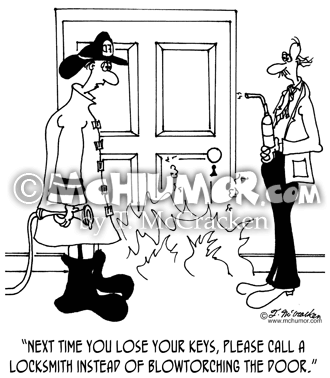 Fire Cartoon 4068: A police officer writing for a fire truck parked next to a hydrant while fighting a fire says, "Sorry, guys, but I'm behind on my parking ticket quota."